The Gay Gamer: Are you ready to blast the underwear off of another set of buff baddies? Are you ready to blast the underwear off of another set of buff baddies? 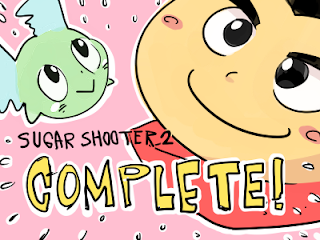 You bet I am--especially if the bosses who appear in Sugar Shooter 2 are as cute (and, yes, as hot) as those who were featured in the first Sugar Shooter. Unfortunately, I won't know if that's the case or not for a while, as this Mac/PC-based bullet-hell shmup, although finished, has only been sent to those who pre-ordered it thus far. A note on the Dudedle Studio blog promises it will be made available to the rest of us shortly after the Japanese version drops on (or around) Feb. 19, though, so at least there's that. 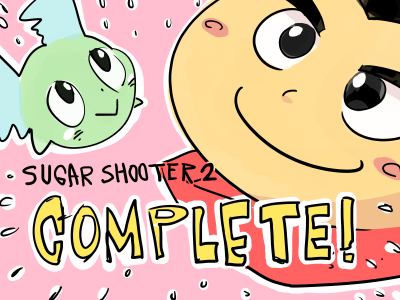 In the meantime, why not busy yourself (as I am) by playing through the Sugar Shooter 2 demo that can be downloaded here? Huh! Do you think it was because you're in another country, Anne, or because you were using public wifi? Either way, weird! That sounds more like the wifi filter kicking in. I've had a go at the demo. Confusing as heck LOL but amusing none the less. diaglyph: Not sure if this will make you feel better, but I found the demo a bit confusing, too--and I played the hell out of the original! I have a feeling it'll all make more sense when I play the full version (or at least that's what I'm hoping). And you can play this one, Justin, since it's on Mac. Unfortunately, I haven't tried the demo on my Mac yet, so I can't speak to that. Let me know what you think of it if you give it a try, OK? Oh yeah, it was definitely the Hungry Jack's wi-fi settings blocking "risque" content. It didn't even cross my mind when I clicked the link that it would raise a flag, haha. Ah, well, I'm glad it was just the Hungry Jack (ha!) wifi and not the link I included in the post.